The six degrees of separation theory can now be tested to help you land the job of your dreams. LinkedIn and CNNMoney have launched a new widget that will allow users to view their LinkedIn network alongside FORTUNE’s annual list of “100 Best Companies to Work For.” According to LinkedIn, CNNMoney is the first site to integrate LinkedIn’s Company Insider widget. The new feature will allow users to view the people in their LinkedIn network who are employed by FORTUNE’s 100 Best Companies. 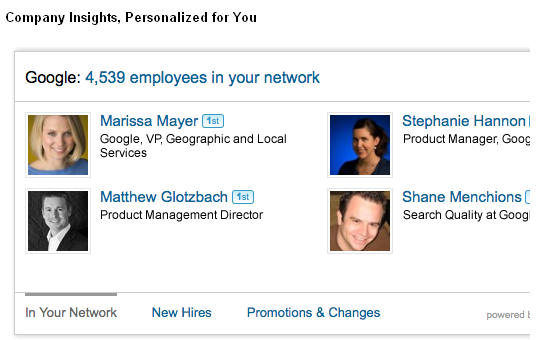 The new widget will also provide a list of new hires and job changes at each of these companies. Companies that are part of the coveted list can identify themselves by displaying a Best Companies badge on their LinkedIn page.